This looks like it could be the start of an upward trend. First, the global economy is growing in lockstep for the first time since the financial crisis, according to the World Bank’s Global Economic Prospects of January 2018. This more benign environment can lead central banks to raise rates to constrain inflation and overheating. It’s possible that the Bank will let inflation run to some degree. This should produce higher nominal interest rates but declining real interest rates, as the Bank would be letting inflation rise faster than it raises interest rates. The consensus is for rises in the base rate by a further 1% by next year, from the current 0.5%. 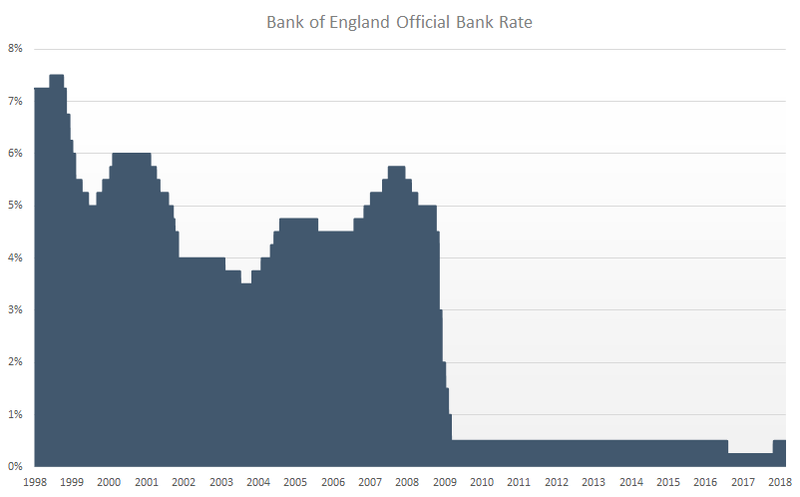 However, even if correct, it’s worth noting that this might leave the Bank having to aggressively play catch up on rate rises if inflation overshoots. Aside from broad economic growth, potential causes of this are rising wages feeding through into the inflation print, or renewed sterling weakness increasing import prices. Given ongoing uncertainty around Brexit, this latter could make a sudden return, as it did last year. What does this mean for investors’ portfolios? Well, for a start, inflation may start to eat away at their real values faster than it has done for a decade, and as the rate for cash will likely lag, it will be an even less attractive asset than it has been for the last few years. Equities are a harder call. Historically, investors have usually seen equity markets as a better bet in times of inflation than bonds, and the re-allocation of cash which results has often proven beneficial to it. That said, equity markets have benefited enormously from quantitative easing and so any suggestion that the era of easy and cheap money is closing could prove very challenging. The real warning lights are flashing with bonds, though. As rates rise, the value of a bond traded on the open market will fall. As an example, a bond is currently yielding 5% with a price of £100, so it pays 5%. Let’s assume that rates go up 1% and so investors are now expecting a 6% return. For that 5% interest to be worth 6% to a buyer, the same bond is now only worth £83.3. It’s a bit more complicated than this in practice, as the effect will depend on what type of bond it is and how long it will be until the capital is repaid. So a dramatic and simplified example, but one which illustrates why there is so much sensitivity to even relatively minor rises in key bond rates when they are at historical lows (and so bond prices at historic highs). Even if you assume buying at par and holding to redemption, there’s little value to be found in public bond markets. The yield on a 10-year gilt is currently about 1.5%1 – already less than inflation. On UK corporates (as measured by the Vanguard UK Investment Grade index2), it’s just one percentage point more – and so still 0.5% less than inflation. Even European high-yield debt yields have fallen to about 3%3. So bond markets aren’t keeping pace with inflation, and all carry risk to capital through the effect of rising rates on the value of their principal. This is where we think the argument for alternative debt starts to make a lot of sense. The average UK net return on the AltFi index was 6% as of December. ThinCats loans returned a weighted average net rate of 9.9% for 2017, and thus provide a considerably greater cushion than conventional bonds. What’s more, bought at auction and held to redemption, investors avoid the falls in traded bond prices that are likely to negatively impact on many portfolios over the coming months. Over the coming year, fixed income assets face some interesting headwinds. Those that offer rate- and inflation-beating returns and low volatility are certainly worth considering. The views and opinions are provided for information purposes only. It has been prepared without taking into account your objectives, financial situations and needs. It is not intended to be and does not constitute financial advice or any other advice, is general in nature and not specific to you. None of the information is intended as an advice or recommendation to invest in ThinCats platform. BLN is not responsible for any investment decision made by you. You are responsible for your own research and investment decisions.